After a period of economic success and high regard in society, clinical psychology has fallen onto hard times, assert authors Nicholas Cummings and William O’Donohue. In the 1960s, clinical psychologists with doctorates were well paid in relation to comparable professions; today, starting salaries are lower than many jobs that require only a bachelor’s degree. Clinical psychology in the 1960s was preferred and valued over other fields as a profession; today it is not even on the list of top 20 fields for graduates to enter. Psychologists’ opinions on social issues are disregarded by the public. What was and continues to be the reason for the decline and continuing descent of clinical psychology? The authors posit that the profession blundered and has not adapted to the profound changes that have taken place in American society over the past 40 years. Psychotherapy practice is based on a 50-minute hour, yet mental health treatment must operate at a much briefer, more efficient pace. Clinicians ignore the findings of scientific research for effective treatments and favor the overblown pronouncements of gurus who preach without substance. Clinicians failed to adapt their practice to the needs of the healthcare industry and do not recognize that psychotherapy is health profession. An anti-business bias has contributed to training programs that ignore the economic realities of running a practice. The failure to secure prescription privileges, the invention of diagnoses, and political correctness are among the other blunders that pull the profession away from its primary mission -- mental health treatment -- and contribute to the low esteem in which psychologists are held. 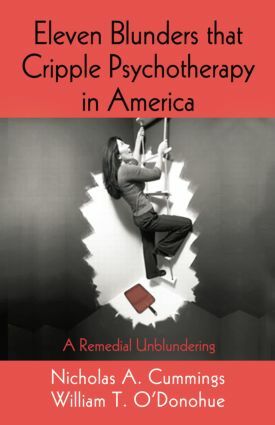 The authors enumerate and discuss the Eleven Blunders That Cripple Psychotherapy in America and offer remedies to correct the ongoing decline of the field.